Make this easy Super Bowl Mac and Cheese recipe for any game day or large gathering. I’m calling this Super Bowl Mac and Cheese because Super Bowl Sunday will be here in a few days and this is a great way to serve up comfort food on the buffet table. Hello, it’s time to get the menu planned . . .! I’m not much of a football fan so I don’t give this too much thought but we still have to eat so I’m cooking . . . I like to make comfort food on days like this. It’s our chance to splurge on the foods we love since we don’t have them very often. Macaroni and cheese is always a favorite. Here’s a TIP for this week — make this super bowl mac and cheese in advance and use a muffin pan to make individual servings. Perfect if you are setting up a buffet table. Last year I shared a lower fat and cholesterol version recipe that my sister ‘the cook’ gave me that I tried and liked so I used the same recipe which you can find here. If you want to go all out and make the rich and creamy version that we all love by all means this is the main event, so here it is. I recently remade this recipe and added white cheddar cheese with horseradish to the mix and shredded some on top of each muffin before baking. It adds a spicy bite but if you know not everyone likes spicy make half without the spicy cheddar and half with. Mac and Cheese Muffins is a great way to serve a large crowd. Make your favorite macaroni and cheese recipe, then just scoop into muffin liners. Bake and serve for any party, super bowl, also add to any buffet table. Cook the elbow macaroni as directed on the package, less one minute so that it’s al dente. The macaroni will continue to cook while baking. In medium size saucepan add the butter to the pan and then whisk in the flour until smooth for about 1 minute to cook the flour a little. Next gradually add the milk while stirring constantly until the milk and flour are well blended. Add in the mustard, nutmeg and salt and pepper and continue cooking for about 5-10 minutes on very low heat until thickened, stirring occasionally. When the milk has thickened whisk in 1/2 of the shredded cheese and stir well. 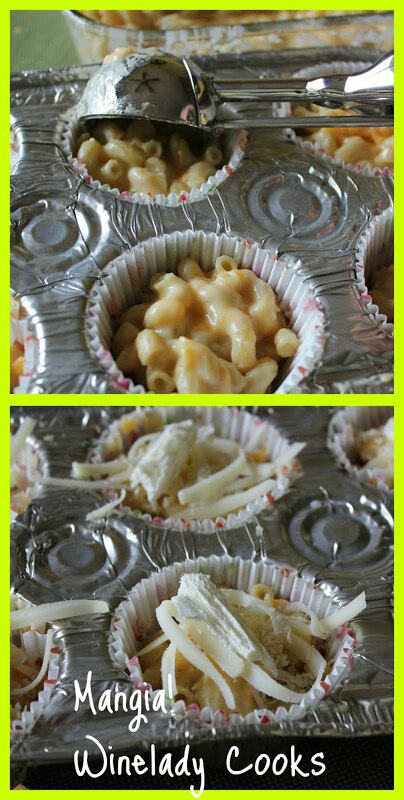 Scoop up the mac and cheese with an ice cream scoop adding to paper muffin cups and place in a regular size muffin pan. Top the pasta with the remainder of the shredded cheese, sprinkle with bread crumbs, and add the butter across the top. Bake for approximately 20-25 minutes or until the cheese is bubbling and the top is lightly browned. The prep time for this recipe is about 20 minutes. Shred the cheese while the macaroni is cooking. A little TIP, lightly spray the paper liners. I know it sounds strange but we found that the cheese was a bit sticky. You can make this recipe up to one day in advance but do not bake. When ready to prepare for the party take muffins out of the fridge about 30 – 40 minutes before you are ready to bake them. Place the mac muffins in a pre-heated oven & bake 15 to 25 minutes (time depends on oven temps and size of the muffins) just before you are ready to serve. That gives you time to relax and enjoy the the festivities. « Sparkling Wines and Football? What a great idea for the big party. This is a great recipe, very tasty. Hope you are having a great week end and thank you so much for sharing with Full Plate Thursday. Hello from your newest follower on GFC, and Networked Blogs and Twitter for now … love mac n cheese and love your blog! Mac & cheese – can’t go wrong! Love the idea of using the papers for small servings. Now, this is a great idea. Individual servings in a muffin pan. I love the idea. Thanks for sharing this and the recipe.